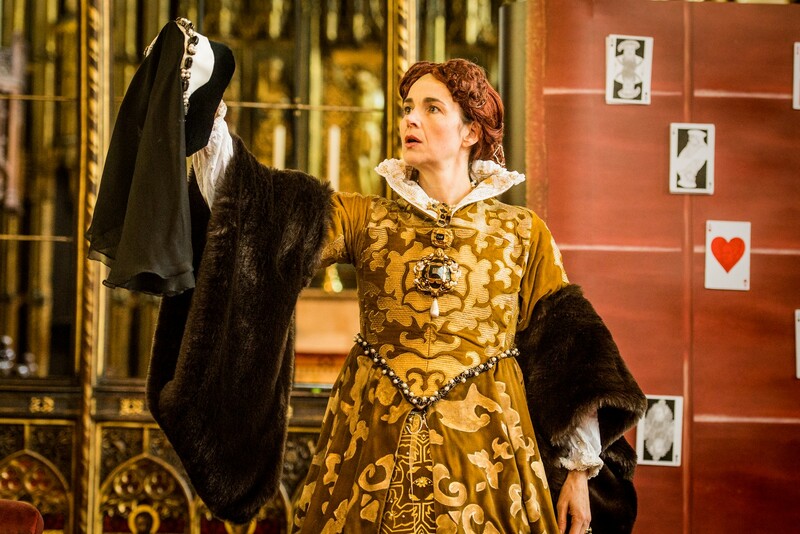 “Elegant, thoughtful, current without being gimmicky and immaculately presented, Mary’s Hand is a 70-minute rebuke to the UK’s major opera companies. 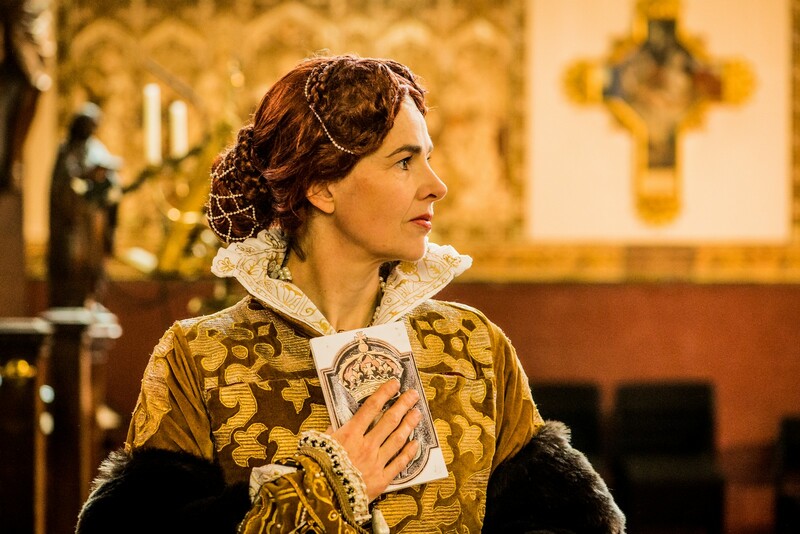 Mary’s Hand is a new opera about the life and reign of Queen Mary I for solo voice and chamber ensemble of cello, trumpet and oboe/cor anglais. Forthcoming performances are listed at the bottom of this page. Read Di Sherlock’s libretto for Mary’s Hand. 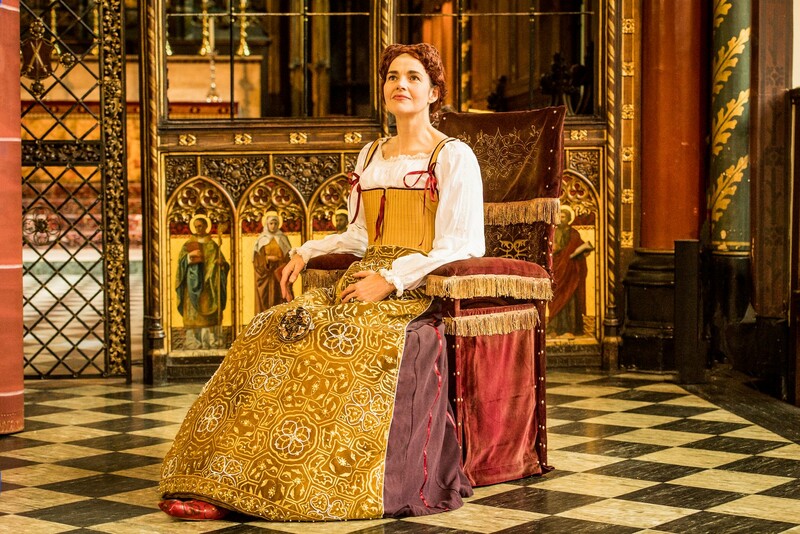 Clare as Queen Mary in a performances of Mary’s Hand at Holy Cross Church, London. 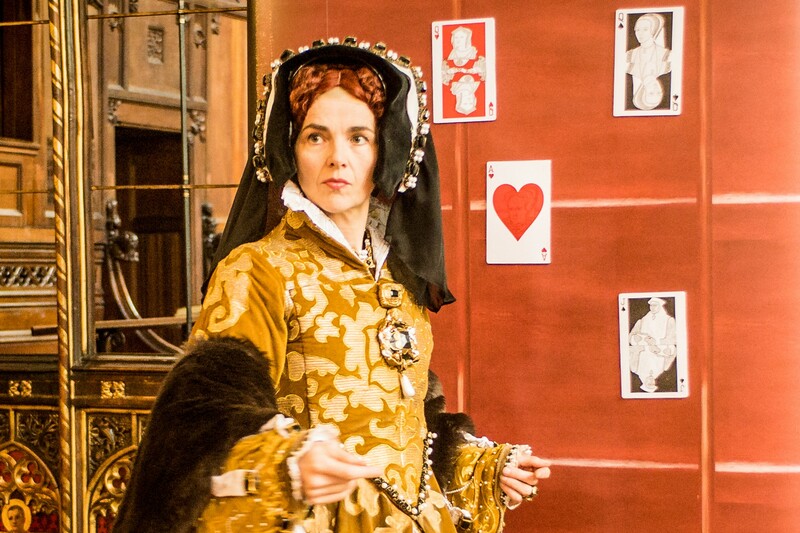 Eclipsed by her younger half-sister, Elizabeth, Mary Tudor lies ‘in the shadow hand of Time’ – confused with Mary Queen of Scots, vilified as ‘Bloody Mary’ or forgotten. Hailed at her funeral as ‘a King’s daughter’ (first child of Henry VIII) and ‘King also’ (first Queen of England to rule in her own right) the hand that Fortune dealt her was a tricky one. 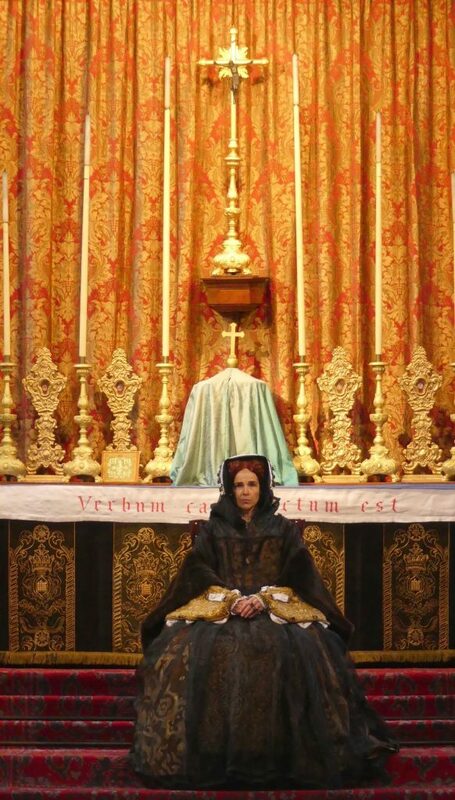 She lies beneath Elizabeth in Westminster Abbey, awaiting resurrection in the afterlife and in the popular imagination.It’s a little-known fact that Mary loved games of chance. At the beginning of Mary’s Hand Mary invites the audience to help tell her story in a game of cards. The cards (Court Cards – Royals only!) represent the key players in her life. For the show to begin the audience must choose a card. The choice of that and subsequent cards determines the order in which she will sing her story and reflect upon influences and events: her father Henry VIII, her mother Catherine of Aragon, her Catholic faith, as well as the perceived causes of her troubles; her half-brother Edward, half-sister Elizabeth, the ever-stronger Protestant faith, and her desperate desire for a child. Mary’s dress is a replica of the dress worn in her portrait by Hans Eworth (right), currently in the collection of the Society of Antiquaries of London. 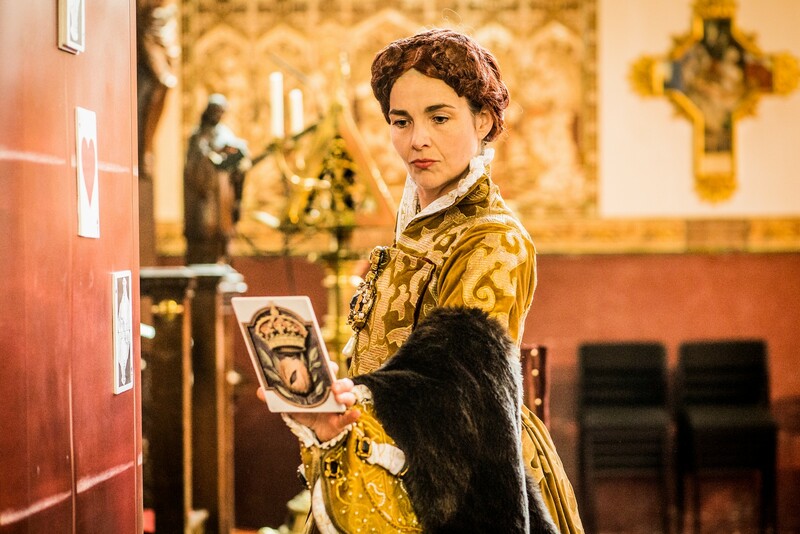 It was important that the dress and undergarments should be as historically accurate as possible in appearance and construction, while accommodating the additional requirements of ongoing performances. Our designers, Andie Scott & Sophie Meyer, preserved aspects of the portrait’s painterliness as well as employing modern construction techniques to enable the dress to function performatively within the action of the show. Key items of jewellery shown in the portrait image were also re-created. Following a successful crowdfunding campaign in April 2018, we secured the support necessary to finish the dress as intended. There are more images, like those below, from the various stages of preparation of the dress on our social media sites (principally Twitter & Instagram) as well as a video from a final fitting on Facebook. Mary’s Hand runs for approximately 75 minutes without interval. 30 July 2019 (10pm) Three Choirs Festival. Historian and author Linda Porter gives a companion talk – The Real Bloody Mary – on 31 July (9.30am).